Celebrating Jon Lord • For details and reviews of the special memorial show on April 6. 2014, check our dedicated page for the event. November 11 • The first complete collection of The Artwoods studio recordings is due early 2o14. Jon Lord’s first fully professional band, the set runs from 1963 to 1967 and includes a rare BBC session, acetate and live tracks. Details on DTB. September 16 • A special concert performance of To Notice Such Things made in Norway in May 2010 has been released as an online experience. Read about this on a special page here, and follow the link to the site. July 15 • Details of the forthcoming Jon Lord Photo Biography, All Those Years Ago, have been released. The full details are on the site here. July 1 • Vinyl edition of The Concerto finally released. Details on the Concerto 2012 page. June 26 • One DTB reader was told recently that there will be a documentary on Jon aired in July to mark the anniversary of his death. If anyone hears any more do let us know. Thanks to Chris Lee. How quickly a year passes. May 30th • A special 50 minute Israeli radio program, featuring the man himself (and many more) talking about his love of rock music and classical music is available to listen to on the web. Jon tells the story of his musical life from early age till 2010 (when he was interviewed). Also taking part in the programme, which lasts nearly fifty minutes, are Ian Gillan, Roger Glover, Ian Paice, Glenn Hughes, Rick Wakeman, conductors Paul Mann and Eberhard Schoener, the Israeli musician Daniel Ratner and Jon’s daughter, Sara Lord. It’s been put together by Eli Lapid, The Voice of Israel. Feb 25th • It has been announced that the Jon Lord Memorial Concert will replace the annual Sunflower Jam this year. It is expected to take place around the usual time (October). UPDATE May 30 – this projected date may now change. Feb 21st 2013 • At this year’s Grammy awards, during the “remembering those we lost” section of the show, it was nice to learn that Jon Lord was acknowledged. Dec 3rd • It looks as if some of Jon’s compositions will be published as sheet music starting in the new year, while there is talk of a special concert in his memory towards the end of 2013. Some of the tabloids have been reporting Jon’s will; most of his estate goes to his wife, but he has left his piano to his grandson. The special edition of the Concerto is now out. Oct 17 – 2012 • Vince Budd tells us he’s just purchased a CD called ‘Dance’ by the Smith Quartet which contains a rather lovely piece written by Jon called ‘Zarabanda Solitaire‘. It was especially written for the Smiths. This has certainly slipped under our radar, and although Jon doesn’t play on the CD you may want to hunt it down. The 1CD and 5.1 CD editions of Concerto 2012 are now out and shipping, though stock of the 5.1 pressing has already run out. You might have thought that having done all the artwork I’d qualify for a sample copy – but apparently not! Oct 2 – 2102 • Jon’s Before I Forget solo album, out of print for some time now, is back out on CD in a couple of weeks. Details on the site here. Sept 21 – 2012 • Jon was remembered by musicians and contemporaries at this year’s Sunflower Jam at the Royal Albert Hall on September 16th. Also this week, promotional copies of the new recording of The Concerto have been going out to the press. Work on the large 72 page special book edition which will follow a little later has also been completed. Lastly, the moving news that Jon signed copies of the upcoming California Jam photo book has been released and you can read about this in more detail on the blog here. Nick Simper has written a personal piece on his website, and about hoping to meet up with Jon when they were both appearing on the same bill recently. “It seemed only a matter of time before we met up again. Finally it looked on the cards as we were both appearing on the same weekend at a festival at St. Veit in Austria. Sadly, Jon cancelled his appearance, and it was then that I learned of the seriousness of his illness. During our show I asked the audience to join us in sending good vibes to Jon for a speedy recovery, and the resulting roar from the crowd said it all. Record Collector magazine is going to have a tribute to Jon Lord in the October edition on sale Sept 13th. Classic Rock September issue has a big feature and Jon’s last interview. Jon’s funeral service. Although we had a lot of enquiries, Jon’s family very clearly wanted a totally private occasion for Jon’s funeral. 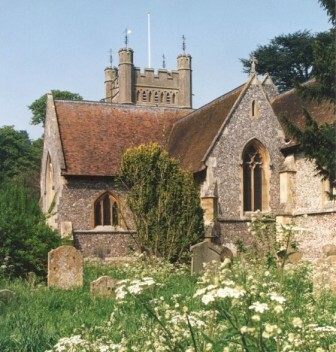 The service took place in Hambleden, St Mary’s Church, on Tuesday July 31st and was attended by family and close friends. They have announced that a more public memorial service is to be held in London. Concerto 2012 edition : Detail of the first three editions are now on the Concerto page; 1CD, 5.1 CD, vinyl and deluxe edition (with the CD, making of DVD, book, extensive notes, etc.) I suggest you wait (if you can) for that. In the meantime the link here takes you to a special page with more details, CD sleeve and recording photographs. Aug 13 – vinyl edition also announced. Jon gave his final in-depth interview to Classic Rock magazine less than a fortnight before he died. This will appear in their Machine Head special in September. July 17. Jon Lord died on the morning of July 16. 2012. A founder member of Deep Purple, and a musician whose unique Hammond sound was integral to the band’s music, after a year’s work Jon had completed work on a new studio recording of his Concerto For Group & Orchestra just a couple of months ago. Courteous and patient when I met or corresponded with him over the years, Jon was always quick to let us know when we’d slipped up on anything on the site – but in a way which was always grown up and more often than not amusing. We’ll miss his musicianship more than we can say, but are thankful for the astonishing musical legacy he has left behind. I have tried to put some thoughts together on the obituary page, and also opened a page to pass on what other people have been saying. Jon was in the London Clinic when he died; he’d been admitted a few days ago.